is a fantastic combo made from the finest materials available. This is a Fully Modular Cab Enclosure which means all panels connect to each other. This make your Cab user friendly when dealing with changing weather. 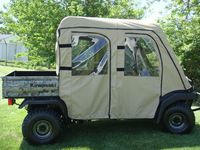 The Doors, Top and Soft Back Panel all can be removed from your UTV quickly and easily. If you have Quick Connect Clamps or Simple Grip Straps, your Windshield also can be removed and then reinstalled at a later date in the same manner as your soft panels. Lexan Windshield: The Lexan Windshield is 1/4" Lexan 9034 for our Standard & Premium Windshields which is much stronger than the 3/16" versions that will bow at high speeds with fast sports UTVs. For our Deluxe Windshield we use Scratch Resistant Lexan MR10. If you are going to attach wipers to your Windshield, you will need to use our Deluxe Windshield. Clamping Systems: We use Quick Connect Clamps for our Premium & Deluxe Lexan Windshields. These make installation a breeze. After the clamps are on your rollbar, you never have to remove them to take your Windshield off. Just loosen the knob bolts to remove the Windshield. Easy on.....solid fit.....then easy off. We have a new clamping system that is more affordable and even easier than our Quick Connect Clamps called Simple Grip Straps. These are tough, easy to use and wont let you down. These can be used with all our Windshields. We also have Loop Clamps. These are a more permanent fixture for your Windshield to the roll bar. Edging: Our Premium & Deluxe Lexan Windshields include a 2" strip of rubber edging along the bottom and both sides. This protects the Windshield from hitting the rollbar when running hard, the rubber edging stops that cold. Standard Windshields include a 2" strip of rubber edging along the bottom. Materials: Pacific Eagle UTV uses the finest professional grade marine fabric made of 100% polyester with stay-true long lasting colors with stabilized fit of less than 1% stretch or shrinkage. Our marine fabric is water repellent, tear resistant, puncture resistant, mildew and UV resistant. The Door Windows & Rear Window is made of durable Aqua-View Smoked vinyl allowing for an uninhibited view and total clarity. Pacific Eagle UTV uses marine sewing thread made from selected high tenacity, heat resistant, continuous multifilament polyester yarns. Along with the highest quality materials, all Pacific Eagle UTV Enclosures are hand measured and handcrafted to ensure a precise fit. Dual Vents are now available as an extra option for only $10.00. A line of vent openings have been cut in front of the driver and passenger. The vents open and close by sliding the vent covers from side to side. Zip Open Windows in the Doors make your Cab more user friendly. These only cost $35.00 for a pair or $70.00 for a set of 4 Zip Open Windows. when ordering a Lexan Back Panel with this enclosure. If you don't want both, order a Full Cab Enclosure with a Lexan Windshield and Lexan Back Window. Tinted Windshield is available for an extra $150.00. Click the link for more information on this enclosure!